Basic set up for playing a chip shot. This technique can be used with all clubs to give you different distance options with just ONE consistent swing. It is my opinion that you can utilize all the clubs in your bag, including the rescue clubs and woods. PICTURE No1.1. Place your feet closer together, approximately 1 club head lenght apart (This is aproximate as I believe you find your own personal comfort position). Place the feet either parallel to the ball-target line or slightly open as I am in the picture. PICTURE No2. 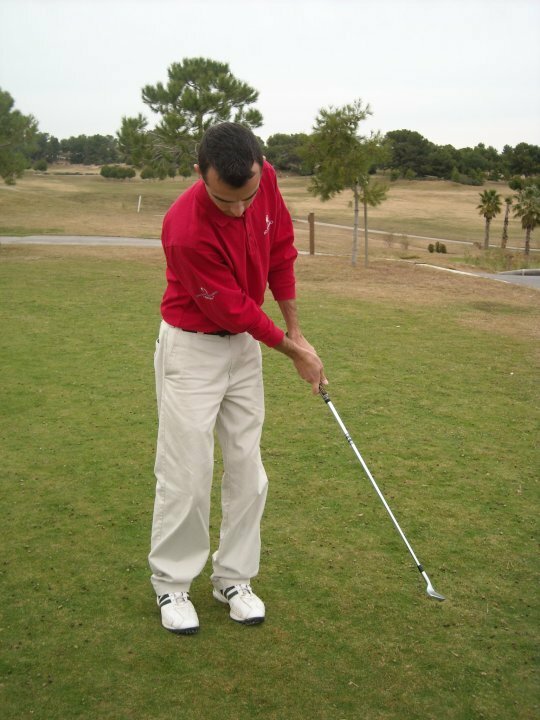 2.Place the club on your target thight (left thight for right handers). 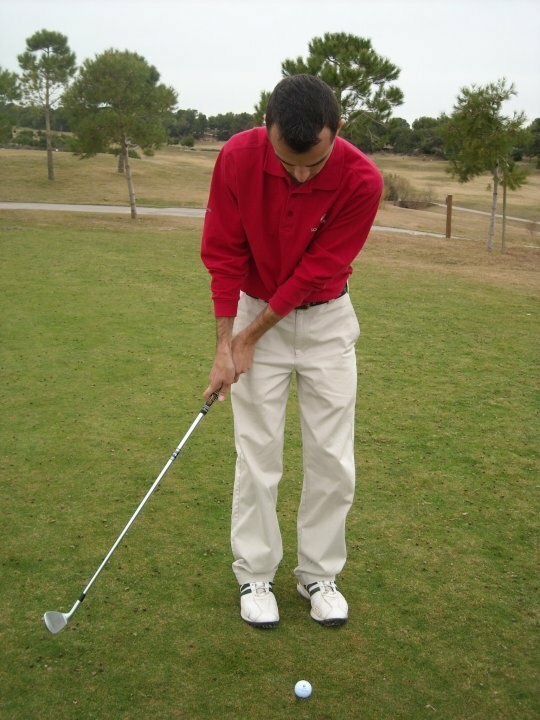 This is the position you want your hands to remain at adress, slightly ahead of the ball. 3.Place the ball opposite the center of your feet. PICTURE No.3 4.Using a short, compact putting like action chip the ball forward. (Your swing should resemble a pendulum). 5. KEEP YOUR WRISTS STILL DURING THIS MOTION. 3 CHIPPING DRILLS YOU JUST HAVE TO TRY! 1. 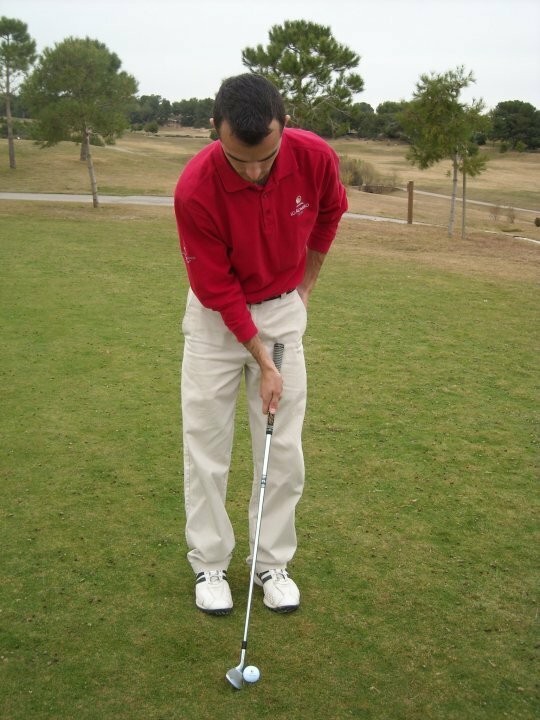 The Bottle Drill (beginners drill) Place a bottle, on the ball to target line, the desired distance behind the ball. This distance represents the lenght of back swing you want to use with all the clubs. Using different clubs simply watch and learn the ball flight and shot distance with the different clubs. 2. Bar Towel Drill (intermediate) Choose a target and your club. Place a bar towel or a small golf towel on the green where you intend to land the ball. Hit chip shots trying to land the ball on the towel. This will help with visualizacion and your imagination on the golf course. 3. Awareness Drill (all levels) Pick a target and the club that you would use, get set up. Then close your eyes and chip the ball to the hole. Before opening your eyes, call out whether you think the ball is short, long or next to teh hole. You'll be amazed at the results.! IF YOU WOULD LIKE TO HAVE A LESSON WITH ME CALL 902 18 09 18 OR 652732474. I AM BASED AT LO ROMERO GOLF, PILAR DE LA HORADADA.